New Stainless Steel Pepper Mill from William Bounds features battery operation with a built-in light. When you press the button to grind pepper, the light on the bottom turns on, making it easy to see how much pepper you are grinding during candlelit or outdoor nighttime meals. This 9 inch tall mill uses a non-corrosive ceramic milling mechanism, which can be adjusted from a fine to coarse grind. In addition to stainless steel, this Electrix Pepper Mill is also available in white, black and chrome. Retails for $65. Unlike most digital "forks" the Digital TempFork (# DTF212) from Component Design Northwest features nine different, fully programmable setpoint temperatures that you can set independently, for each of your favorite recipes, meat or poultry. An alarm is sounded with the chosen setpoint temperature is reached. This way you can easily achieve your desired level of "doneness". Since the Digital TempFork can also be operated as a basic digital fork thermometer without using the alarm, it features a large backlit display panel. This makes it easy to read during a nighttime barbecue. To provide better feedback on how close to "done" you are, part of the display is a circular grid that begins to fill in as temperature increases toward the desired end temperature. This display turns off automatically to conserve the two AA batteries. The Digital TempFork has extended the Reinforced stainless steel tines into the handle to provide a 10-pound handling capacity. It has a suggested retail price of $24.95 with a two-year warranty. Oregon RM888PA features triple displays in a slim package - a backlit "numeric" digital display, a backlit "analog-look" digital display and a focused digital projection on the ceiling of your room! This clock automatically sets itself wirelessly with data based on the U.S. atomic clock. 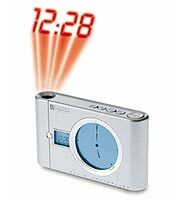 Has an 8 minute snooze alarm and retails for about 90 dollars. The Brother PE150 is being introduced at the 2002 Housewares Show. This embroiderer offers advanced technology for about $1,000. Since an LCD touch panel is located on the unit, you can easily select, view and even edit designs before they are sewn into cloth. 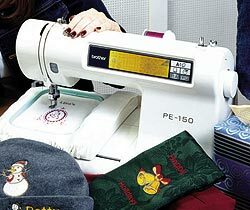 It features the usual sewing machine features, but also includes 60 embroidery patterns, 3 built-in fonts, 10 frame shapes and 12 different border styles. Since thread is "vector-based" technology, designs can be scaled up or down or rotated in 45 degree increments to fit the final design size of up to 4" x 4". The PE-150 is compatible with Brother's embroidery memory card libraries that contain themed embroidery patterns. For even more design versatility, an optional software package (PE-SCAN 2) is available to help you easily create original designs. Once your designs are either drawn or scanned on your PC, they can be easily edited. When complete, these designs are then saved onto reusable memory cards that can be used by the PE-150 to sew your pattern. If you already have a digital image, Brother offers PE-DESIGN 2.0, which allows designs to be converted, edited and digitized on a PC or even downloaded from the Internet! Chef'n PopOut Peeler features an ingenious retractable blade, hidden in the handle until you need it. One single "click" and you are ready to peel. Both the single button interface and color scheme is "iMac-like". Available colors are transparent red, purple, blue, yellow and gray. It is top-rack dishwasher safe and retails for the price of an inexpensive mouse (under $10). Haier Wine Coolers offer convenience and elegance with digital performance. The automatic digital control allows for the storage of both red and white wines and has a temperature range of 45 to 65 degrees F. These wine coolers are CFC-Free and have a locking door with a key. They are available in either black or cherry wood cabinets. Sizes range from 20 to 100 bottle capacity and prices start at $299. Copyright © 2002 Rick Smith and Bill Smith All rights reserved.